The USTA Southwest Jr. Team Tennis Championships came to a resounding close with four new champions being crowned as Section Champions for the 2010 season. Three days of championship play in four different divisions were held at Scottsdale Ranch Park, August 1-3, and filled with fun, camaraderie, and most of all, team spirit. 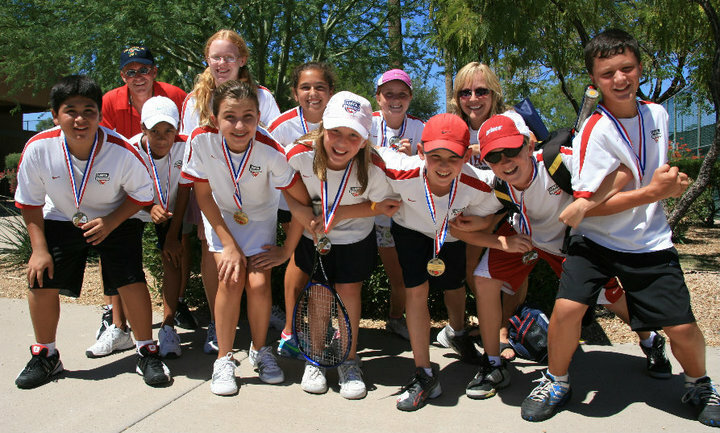 Teams had advanced through local league competitions to earn their appointment at the USTA Southwest Jr. Team Tennis Championships. Jr. Team Tennis offers co-ed play and the chance for kids ages 6-18 to test their competitive mettle in a team format and to play with their friends. The format for the event is "games-won", which places a greater emphasis on team, rather than individual play. Lines of girls singles, boys singles, girls doubles, boys doubles and mixed doubles also allowfor variations in play. In the 12-and-under Intermediate Division, the Arrowhead Aces (captain Gwen Schulz) stormed past all opposition, outdistancing the second-place Tie-Breakers of Las Cruces, N.M. by 30 games. For the Aces, it was sweet redemption from a second-place finish in 2009 at the Southwest JTT Championships in Albuquerque. The Aces went 3-0 and were never really tested by the four-team field, that also included the Jerry Cline Team 14s (Albuquerque), and the First Serve 12s of Santa Fe. Arrowhead Aces team was composed of - Michael Schulz, Andre Bordeleau, Autumn Prudhomme, Bailey Wood, Bryce Wood, Ethan Prost, Jayden Williams, Lena Sweiss, Samantha Cole and Sara Hileman. In the 14-and-Under Intermediate Division, the Tanoan Country Club White Stripes (captain David Krauss) posted a 3-0 record in their division, and a whopping 50-game lead on their nearest foe, The Club at Winfield. The White Stripes (Albuquerque), won 13 of the 15 individual matches the team played, and lost just four total sets at the Champioships. Two other teams from Jerry Cline Tennis Center and the US Aces of Las Cruces, N.M. rounded out the 14U Intermediate field. The White Stripes now move on to the Jr, Team Tennis National Championships, held Oct. 22-24 in Surprise, Ariz. at the Surprise Tennis and Racquet Complex. Team members of the White Stripes were Ben Krauss, Achyut Warrier, Austin Lininger, Caroline Donahue, Clare Donahue, Dane Paulsen, Henry Collis, Louis MacKenzie and Stacy Pollack. In the 18-and-under Intermediate Division, Dirty South (Captain Michael Shemwell) of Las Cruces, N.M. put on a dominant performance, winning all three team matches against two squads from Albuquerque (La Cueva 18s and TCA Toro Lobos), as well as a team from Flagstaff. Dirty South rolled to a 36-game advantage, and won 13 of their 15 individual lines. Team members of Dirty South were Brenner Thome, Gabrielle Joyce, Jeremy Harlas, Jonathan Vigil, Kelly Brenner and Natalie Rivera. In the 18-and-under Advanced Division, the NM Lobos/LPTA Academy (captain Derek Lynch) of Albuquerque rolled over the two other teams in their division, the Tennis Wizards, a combined Las Cruces/El Paso squad. and Hamilton V, of Chandler, Ariz. The NM Lobos/LPTA Academy went 2-0 in their division, and won nine of 10 lines and 18 of 20 total sets played. 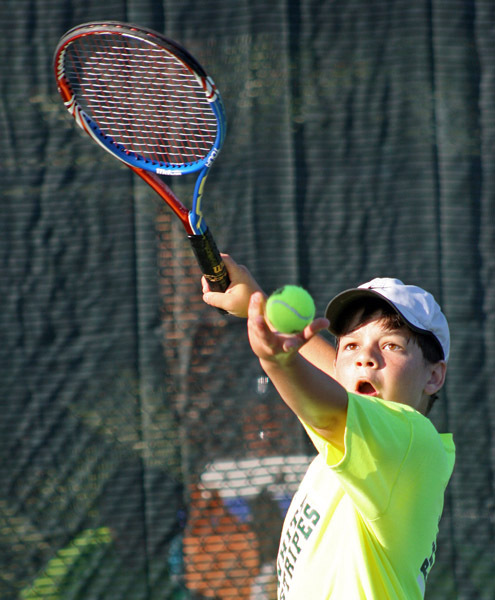 Both 18-and-under division winners earned the automatic Section berth into the USTA Jr. 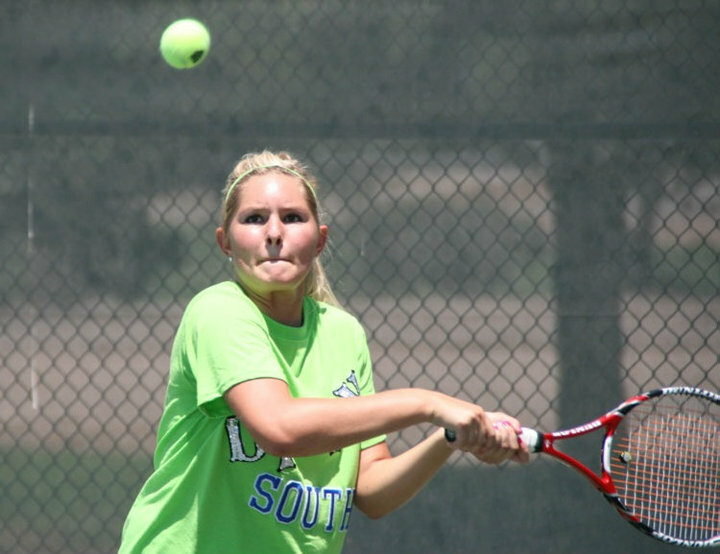 Team Tennis National Championships for the 18s level, held Oct. 29-31 at the Surprise Tennis and Racquet Complex. USTA Southwest also held a Player's Party at the host hotel - the Hotel Valley Ho, on Monday night, August. 2. 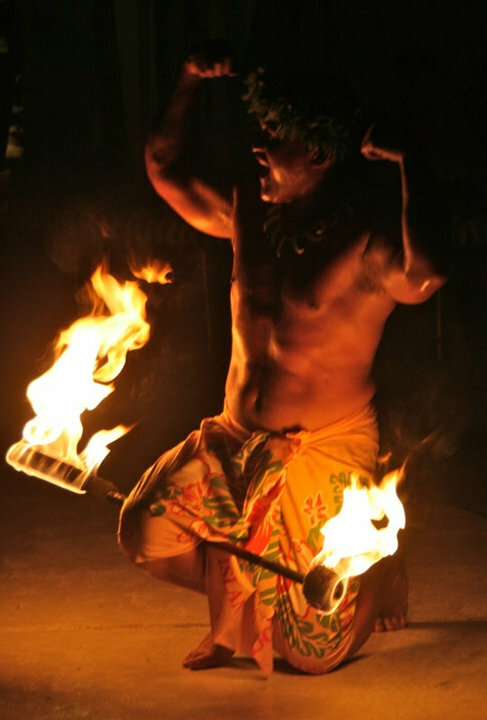 The party was a luau theme, and a group from Kilali's Polynesian Revue stopped by to bring the true Aloha spirit to our players, who were instructed how to luau and given jula exhibitions and lessons by the dancers. A fire knife performance was also held, which drew a lot of "oohs" and "ahhs". Prizes for best male and female hula dancer were also given out, with the winner picking up Apple iPod Shuffle devices. A limbo contest was also held poolside at the Hotel Valley Ho's amazing circular pool and raffle prizes, including USTA Jr. Team Tennis gear, were given out to participants during the party. 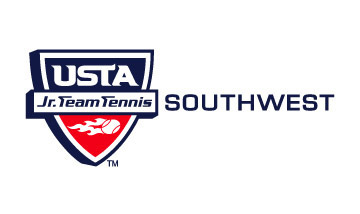 We wish good luck to all of our advancing teams, and send out a special 'thanks' to all of our teams for participating and parents and coaches for showing up to support their players at this year's USTA Southwest Jr. Team Tennis Championships. We will see you next year! Check out the Facebook Photo Gallery of the tournament at www.facebook.com/ustasouthwest. A complete photo gallery from the event will be posted soon and the link sent out to team captains.